Free Universal Pre-school program from NYC Department of Education. The hours are from 8 am to 2:20 pm, and extended hours available, depending on family needs. Registration opens in April for the September-June School year. The spots are filled quickly. Please bring a copy of your child’s birth certificate and 2 proofs of address as well as the child’s current physical health form or immunization card. Your child will be exposed to many kinds of learning experiences including: arts and crafts, music, read-aloud (books and stories), self-initiated play, numbers, colors, shapes, letter recognition, circle time, computer time, block play, sand and water play, table toy manipulatives, dramatic play, and science play. Age appropriate activities are scheduled with flexibility to the needs of the individual child and day. We offer outside play when the weather permits. 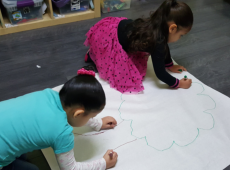 We follow a curriculum that includes, developing large and small motor skills, and do many arts and crafts that focus on process, not product. Free play is an important part of a child’s early years. It is here that they learn social skills that will be needed for the rest of their lives. We view curriculum as everything that happens during our time together with the children. We believe that each moment offers an opportunity to explore relationships and create a community that nurtures children, teachers and families. The purpose of field trips is to enhance learning. All field trips are age-appropriate. We take the children to orchards for apple picking, farms to see farm animals, museums, and botanical gardens during spring. A consent form signed by the parent is required before transporting children. If we do not have your permission, we cannot and will not take your child out of the building. All traffic and safety laws will be followed. No child will ever be left unattended. We welcome participation of parents on field trips. If you would like to become involved in field trips, please tell your child’s teacher.